Although the foundations of cricket were laid just a few miles up the road at Hambledon, relatively little is known about the East Hants Cricket Club and it's ground in Southsea. The club is first mentioned in 1831 when they played Midhurst at Midhurst, a time when they probably existed as no more than an ad hoc collection of players who moved fluidly between local teams. Before 1845 they had no ground to call their own and it is not known where the inspiration to create one was founded. 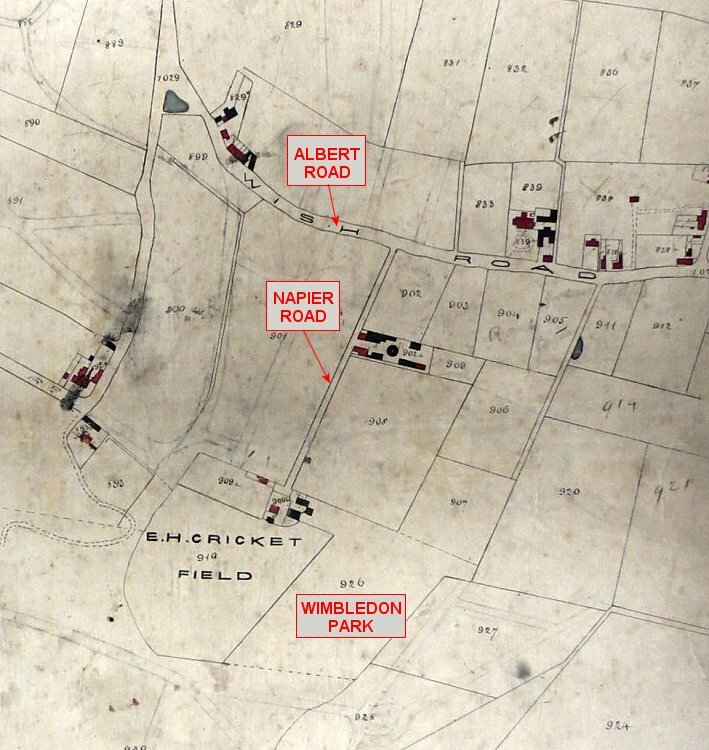 The ground, when adopted, occupied an area at the southern end of Napier Road, the Clubhouse/Pavilion being built on the spot later to be occupied by The Taswell Arms (now private accommodation). It was constrained by the marshy land on three sides, to the east by the area that was to become Wimbledon Park, in the west by the six foot drop down to the future Brandon Road and in the south by the part of the morass that became Florence Road. The exact date the ground was opened is unknown but we do know that the Hampshire team played Henfield there on 19th and 20th July 1848. We also know that when Thomas Ellis Owen completed his Tithe Map & Survey of Portsea Island in 1845 the cricket ground did not exist. This may be confusing as the extract from the map (see above, right) clearly shows it's location. We know, however, that this is a later amendment since the Schedule to the Tithe Map simply lists the field in use as a meadow occupied by a Richard Dawson. We may deduce therefore that the ground was first used sometime between 1845 and 1848. 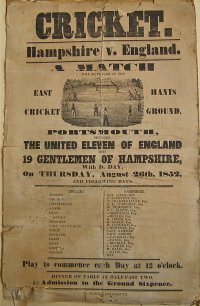 After the Henfield game the next match for which there is evidence was between the Gentlemem of Hampshire and an England Eleven between 26th and 28th August 1852 for which the poster has survived (see left). The former consisted of 20 players who despite these numbers could only accumulate 102 runs over 2 innings which England surpassed with eight wickets to spare [See the scorecard]. The leading bowler for England was John Wisden who took 10 wickets in each innings. He later went on to found Wisden's Almanac. For the first known match played at the ground by the East Hants Cricket Club itself we must wait until 15th-17th August 1861 when the United England Eleven visited [See the scorecard]. The club must have played many matches at the ground but the only ones for which we have reliable evidence are those listed in the Cricket Archive. Included are two matches from 1868 in which the East Hants Cricket Club played the touring Australian Aboriginal team. In the Cricket Archive database the last known match on the ground was played on 18th August 1873 when East Hants played the United South of England XI. The ground was eventually sold off for housing development in 1889 when both Taswell and Worthing Roads were laid across it, the latter becoming an extension of Duncan Road which had formerly stopped at a point just south of it's junction with St. Vincent Road and the former commemorating the extended families of Lake Taswell and his son-in-law Herbert Allen who had owned much of the land in the area.